Yep, I got the same. No real extra investment of note. About to start my second season now. Brought in Alvaro Moreno (free), Gini Wijnaldum (loan), Kenedy (loan), Matias Vargas (£10m), Dolberg (£14m), Stark (£15m), Munir (free), Jonathan Ponzo (loan), Ryan Fraser (£27m!! ), Bruno Varela (£475k). Squad looking pretty stacked now ahead of our Europa League campaign. 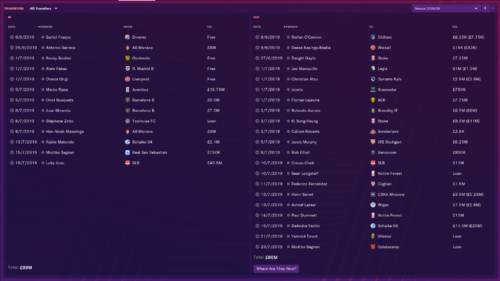 Just finished season 1 last night and kinda wish I hadn't as I got taken over by someone who has no interest at all in developing youth or training, no extra cash and to top it all off Grealish went to Arsenal in Jan! January was a bit strange as I was a bit thin in the middle with the injuries in this game, I bid for Pablo Rosario from Althetico for 7m and then Leicester came in with a 20m bid for Yedlin which I accepted and bid for Clyne who was listed for 12m, but then Yedlin rejected them, also my DoF also recommended I loan Smith-Rowe from Arsenal & Correra from Lazio but id sold quite a few by then so needed the cover! Me too. Zagorakis took over the club. I finished 12th in my first season. First half of the year was hard. I only bought Tierney at the start of the season. My defence was solid but I couldn't score. Muto was awful, he missed so many chances even one on one's. Rondon was worse. Also Ritchie didn't start the season well. I played 4-1-2-3 wide. Hayden was perfect and surprisingly scored most of the goals. 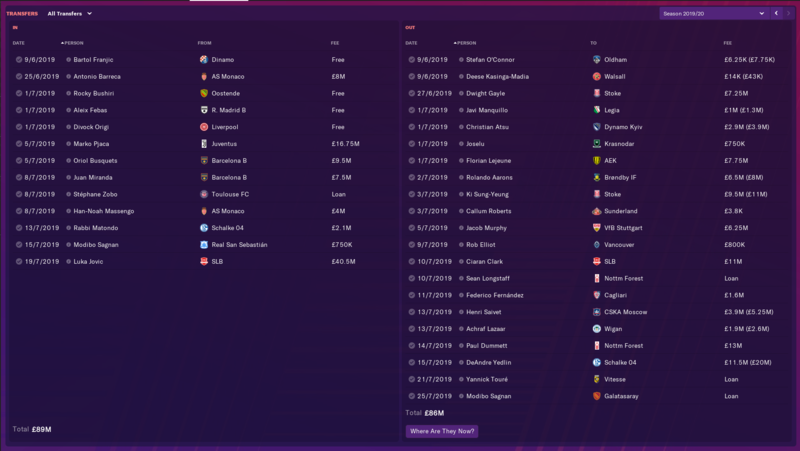 At the start of the second half of the season, I bought Clinton Njie and some young players to add depth (Helstad, Zurkowski, Luko Racic and Cole Dasilva). Njie -bought for 1,5 m) performed really well and earned himself the starting spot. Second half was better we managed to won some big matches. Defense was still solid especially Fernandez and Dubravka at goal. Ritchie made difference in some matches and especially Njie in counter attacks. A group led by Zagorakis took over the club now. I am at the preseason of my second year. I bought Santi Mina (3m) and Almamy Toure (free - Yedlin was good but Toure was free and I couldn't resist, also Manquillo made so many mistakes). I didn't buy Kenedy because he was mediocre last season. I bought Rodrigo de Paul for his spot. Now I will try to strengthen in midfield and center back. I am hoping there is a successful season ahead. I sold Clark, Gayle, Darlow, Elliott, Lazaar, Perez, Joselu and Saivet. Btw still no notifications about Brexit. 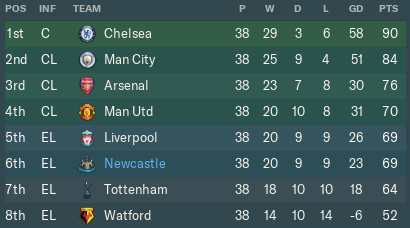 In my save I'm up to 10th January in my first season at Newcastle. On the transfer front, not a huge amount of activity - I've brought in Dan Crowley from Willem II for £5m (£5.5m), Re-signed Kevin Mbabu from Young Boys for £12.5m (£13m) and also picked up Samir Nasri on a free (Who has only made 2 appearances so far due to his global ban until 31/12/18). No outgoings as yet, other than Jamie Sterry and Callum Roberts going out on loan. Things started off well, won all 7 of my friendlies, scoring 12 and conceding 1. Then day one of the league season got off to a cracking start with a 4-0 win over Huddersfield, with Rondon bagging twice on his debut, and I thought I was ready to take the league by storm. Second game of the season that all came crashing down with a 7-1 drubbing at Anfield, and an early Carabao Cup exit at home against Wolves shortly followed. I steadied the ship with a run of 5 wins (albeit mixed with 2 defeats) in 7 games, but then went on a frustrating run of 7 games where I lost once and drew the other 6. Since then I've had a win, draw and a defeat. In my most recent match, we comfortably seen off Swansea with 2-0 home win in the FA Cup 3rd round. Norwich visit SJP in round 4. Next up is a trip to 10th placed Crystal Palace. It's definitely a team effort so far, with the goals and assists being shared around the team, with no one player running away in terms of stats. Main priority now in the January transfer window is a young left back as I really only have Dummett. Lazaar hasn't played much, and following Nasri's signing it was Lazaar who I cut from the Premier League squad - So I am looking to move him on. I have Mbabu and Manquillo who can both play there but neither are rated too highly in that position. Happy to take any suggestions people might have! How has everyone been setting up their team? 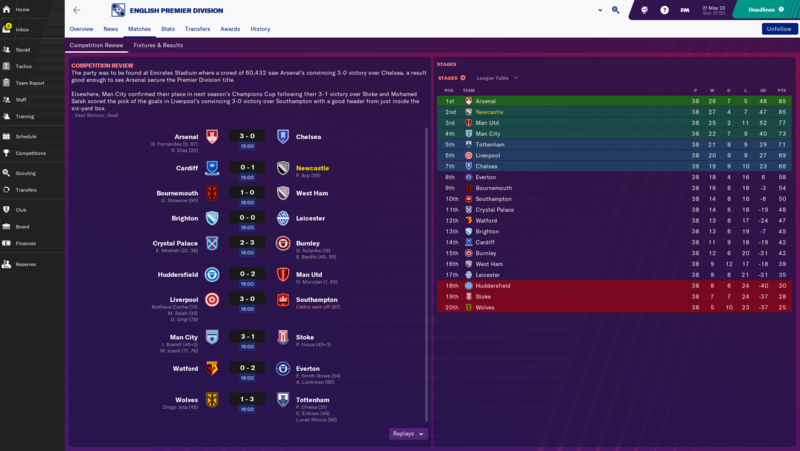 I’ve been really struggling- just about avoiding relegation in the first season and heading that way in the second, despite some reinforcements. I struggle to control the game, possession is rarely in my favour and quite often get dominated in the Shots department too...! This is it after about 18 months and some investment but so far I have won the league, CL and am sitting top after the 2022 WC. I started the game in beta, so managed to get a player in quickly who was far better than I deserved and got Paqueta in sharpish (I had no idea of him but went solely on scouts reports, he was immediately identified as a 91 scouting report). I find the tactic works really well as the FB play as wingers because they have the space to, the mezzala instructions cover gaps wide but don't get too far forward and I have a DLP acting as a quarterback who rarely ventures upfield during open play. The instructions all work with each other and don't conflict, I had a few issues playing a high line as my DC are not the quickest meaning we were often beaten by the ball over the top - I changed one of the instructions to no nonsense DC so he sits a little deeper and just looks to defend. I haven't been on any tactics forums or owt like that but am happy that I managed this myself. I am happy to upload if anyone wants to give it a try. We still get battered occasionally (5-0 at OT this season) and don't have too much of the ball but because of the direct passing we are quick on the counter and pretty ruthless in front of goal. Words cannot express the disappointment. 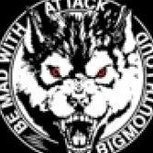 I played a Wolves inspirede tactic, with 3 CB, 2 WB and 2 DMC. It was very hard to score against me, score alot from corners do to the big amount off good heads with 3 CB, MC aso. Midway through season 2 after finishing 10th last season- currently bouncing between 7th and 11th- it's very tight, with the Top 6 pulling away. Current issue seems to be killing off games and the majority of goals come from Corner/Free Kick routines, although Pellegri has started to grab some goals since coming in on loan. Who has everyone signed as Strikers for Season 2 onwards? I've been unable to convince Dolberg, Batshuyai to come despite having bids accepted. I have 25m to spend this window if i need it- or do I wait for summer? I managed to get Schick in from Roma as he was unhappy - cost me £60m (with £15m upfront and £45m over 3 years) but well worth it. Just sold him 4 years later for £70m. 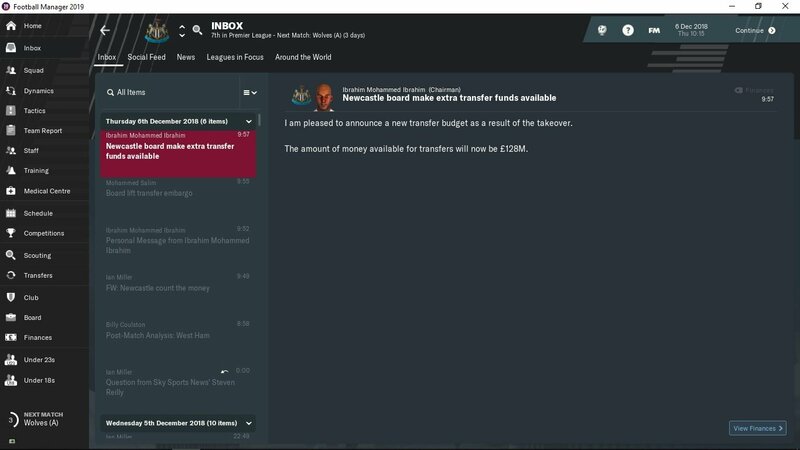 My first save this year will be Newcastle, and the first thing I'll do is to get a new goalkeeper. I just don't trust Dubravka, he's not good enough for the PL. So I'm thinking either Timo Horn or Predrag Rajkovic. But I'm looking forward to my first save of FM19. I still don't rate him tbh... maybe it's because of all the Danish Superleague matches I've watched with him, but I just don't rate him IRL, and so I'll still be looking for another keeper when starting my Newcastle save. I started as Newcastle on FM19 a couple of weeks ago. Really enjoying this save. 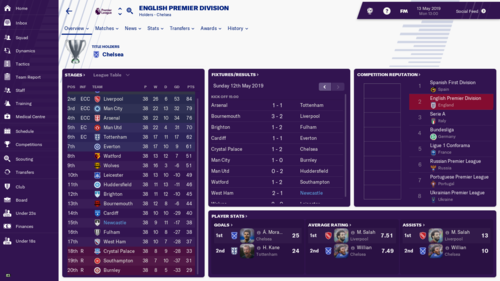 Currently at the start of the second season (P6 W3 L3 so far) having finished 12th first time around, surviving a takeover from a consortium mid season headed up by ex Leicester City midfielder Theo Zagorakis. Didn’t have the best finish to the first season as I was around 8th/9th with 8 games to go, winning only one. Lost in the second round of the League Cup and was knocked out in round six of the FA Cup. Formation wise I tend to play 4-1-4-1 wing play most games, switching the mentality depending on who and where I am playing. Out: Perez 10m Diame 10m Ritchie 18m Yedlin 18m Muto 18m Dummett 18m Ki 12m Dubravka 10m Clark 10m Lejeune 10m. *Saviet 10m and Gayle 10m arranged transfers in Jan. Very happy with my business so far, finances are great and plan to strengthen in Jan especially with two squad players set to depart. Probably need to strengthen DL, MC, AML and ST.
What sort of takeovers are people getting with Newcastle? Anyone had a tycoon? I don't rate him, so will be buying someone else. I've started a career, it's with Newcastle United but may move on at some point. Dubravka, Lascelles, Shelvey , Muto/Rondon seems to be a good spine, Ritchie is also a must. Dubravka, L﻿a﻿scelles, Shelvey , Muto/Rondon seems to be a good spine, Ritchie is also a must. Back up for Hayden, you can loan a LB from Roma. Brought in Ntcham and jetro Willems. Manquillo on his way out too so right back to replace him Nickson recommended Conor Roberts from Swansea who is young and home grown so thinking he'll replace him. 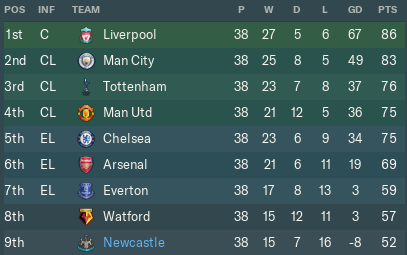 Well I've just finished my first season as Newcastle and to say I struggled would be an understatement. I always like to keep the game as realistic as possible (as realistic as a Sunday league player with no qualifications taking over a Premier League team can be! ), I also disable first window transfers as well, I managed to finish 15th and reached the rounds I needed to to keep the board happy in both cups. I was taken over by the Greek Consortium led by Thodoris Zagorakis, they didn't supply any further funds and delayed me signing anyone by stalling the takeover talks until late in the window (sound familiar to any of you?). Once in place it was a mad scramble to bolster the squad and I ended up with cheap foreign loans (sound familiar anyone? ), I ended up with the following on loan: Able Ruiz a young forward from Barcelona who ended up playing very little and was solely loaned in for cover, Denis Suarez also arrived from Barcelona, he supplied some important goals as a behind the forward play maker in my battle against relegation, Michael Krmencik arrived on loan from Viktoria Pizen via my DOF, he didn't end up playing much either as I tended to rely on a combination of Rondon and Muto. A very frustrating season where I could never seem to go on a run of results, I spent far too much time tinkering with formations/styles and training but given that I have no qualifications or experience I believe I did quite well, my team talks were basically rendered obsolete until I'd earned a tiny bit of respect from the player, this didn't happen until roughly Christmas time. Just when I thought I'd be looking towards next season building my own team I've now been told I need 7 points from my opening games or its bye bye Mr Nelson!! 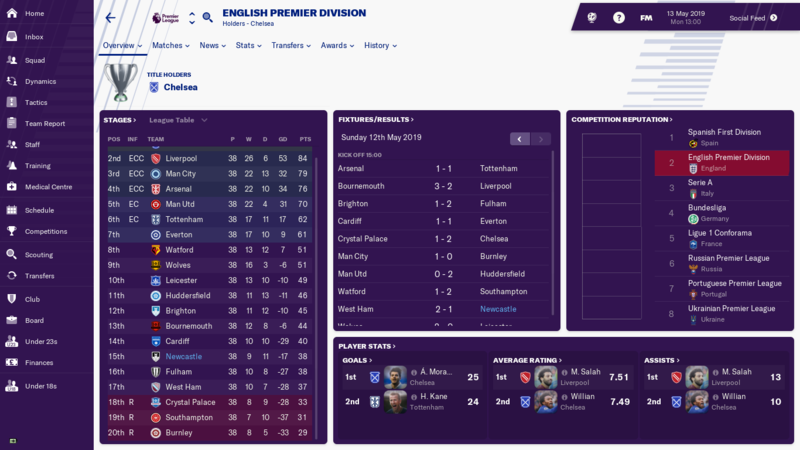 Not a bad first season however I started really well especially with a long ball-ish tactic, mainly to make Matt Ritchie thrive and get enough of the ball in order to make something happen for me. Sitting around 6/9th around Christmas I literally crumbled and didnt pick up a point for around 7 games and then even after 12 I had only gained a few draws. I honestly was looking down the barrel of a sacking already... especially due to being taken over by Olga Smorodskaya who used to run a club in Russia and she's pumped quite a bit of money into the training and youth facilities already which is a good start. 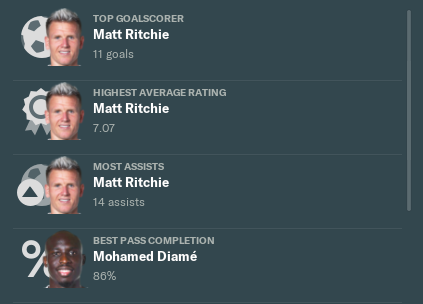 As you can see our tactic that made the most of Ritchie's creativity worked wonders and basically walked the squad on goals/assists/average rating. I rejected a bid from Man Utd in January for £30m for him, however they've been interested in him for the last few months as well so it might be hard to keep them away over the summer. I'll probably look at someone like Markovic from Liverpool if push comes to shove I know he's available probably on a free then so. 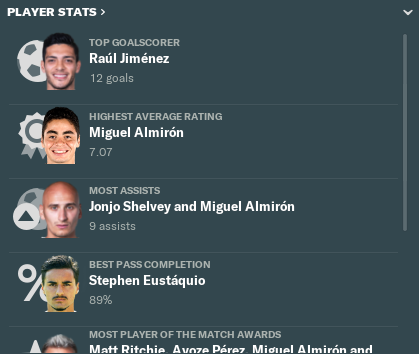 I needed to strengthen massively in attacking area's and Almiron who Newcastle have been looking at a lot in real life came available for a great price and his season in the MLS was fantastic too, being voted the player of the year and I'm sure he was up there for goals too. Murra was also brought in due to the silliness of Paul Dummett who over the season caused a lot of problems for the squad due to mistakes and red cards... in the end he had 5. I'll be looking to ship him out in the summer and replace with someone far better lets hope. Elliot was the only departure for the winter, however in the summer I can see a mass clear out happening. 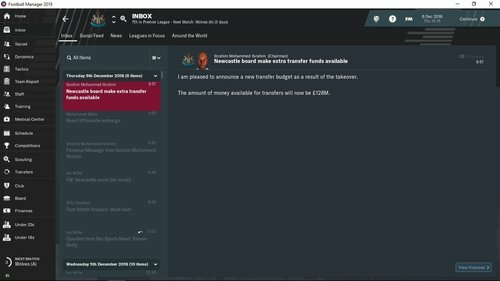 New computer, new save ... Gone with Newcastle. Only made one signing so far, that being Ravel Morrison. Pre-Season is going okay. Will update more later. 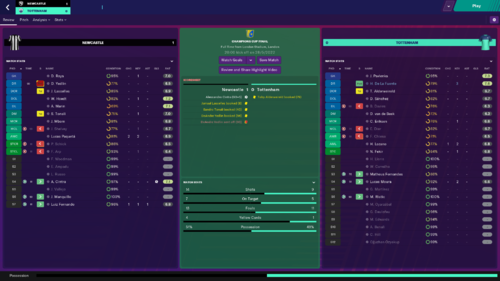 Well it's an improvement from last year and that's all you hope for, the long ball tactic went out the window and I tweaked a few things over pre-season and the first few games of the season to play a gegenpressing 4231 with narrow CAM's. It added a lot of options going forward due to the quick passing in between our technically great players, however when we lost the ball especially to teams who enjoyed a quick counter game we struggled this showed throughout the season as we would be either scoring a lot or conceding a lot of goals. I have also been re-taken over by someone who was apparently a 'tycoon' however when push came to shove he put us on the stock market so I'm not expecting anything over the top funds wise. Our new striker flourished in this tactic by grabbing 12 goals throughout the season, however a large portion of our goals were spread out between the CAM's and the strikers. I can imagine next season we will push on as the team is near enough set and we don't need many replacements if it at all so hopefully this set of players will push us onto Europe next season. A lot of incomings and outgoings throughout the season, some of the prices we received for players during the summer was a no-brainer (Dummett) and we replaced these accordingly. Very pleased with the incomings of Maddison who arrived from relegated Leicester, even though he had to battle with the likes of Almiron, Perez etc he managed to have a fantastic first season in black and white with 10 goals and 8 assists. We also managed to bring in some young players for our U23's side... this will continue in this summers transfer window. 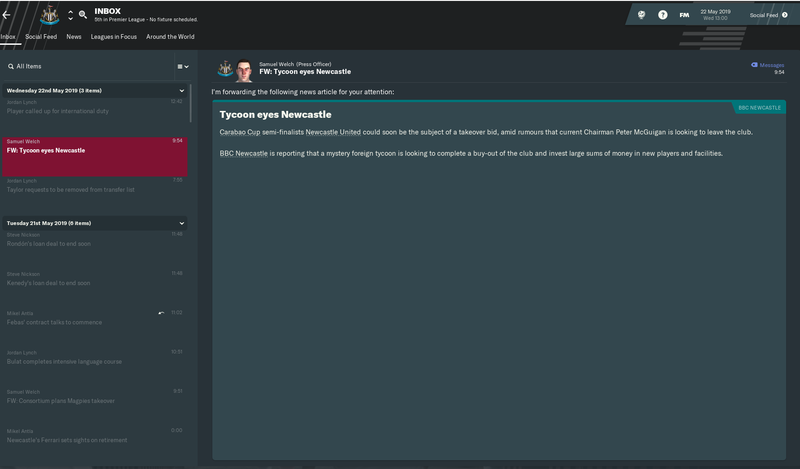 Started a Newcastle United save a couple of weeks ago and have recently started the second season. Thought I'd share the details of my save so far. 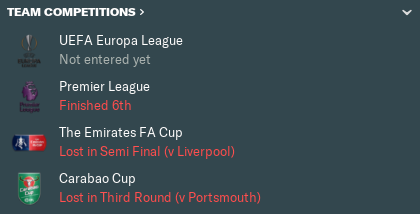 I started off the season very well and was in the hunt for a Europa League finish until we collapsed at the end of the season, losing 6 of our last 7 games! Fared poorly in the cup competitions, losing in the 3rd round of the FA Cup to Wolves and the 2nd round of the EFL Cup to West Ham. So all in all, I was disappointed. Especially considering my top scorer ended up being Vincent Janssen with 7 goals (he signed in January...). I think my transfers were fairly successful, Escalante rotated with Hayden for a spot in my midfield as a CM(D), Origi was originally pencilled in as my new starting CF but Janssen out-performed initially (including a hat-trick against Spurs on his debut). Origi ended the season with 5 goals in 15 games, whereas Janssen had 7 in 15. Not a bad return considering Rondon, Muto and Joselu managed 5 between them all season. I think I am fairly well equipped for another challenge for the Europa League spots. Already planning on looking for a new right sided midfielder for January as Ritchie isn't getting any younger. I started with Newcastle, but quit the save and deleted it after winning the first four games, including a 5-2 thrashing of Liverpool at home. In a spur of the moment thing, I thought it was unrealistic and quit. February: Premier League: 5., Carbaro Cup: Final, Fa Cup: Fourth Round Replay. Anyone started up a save since the update? 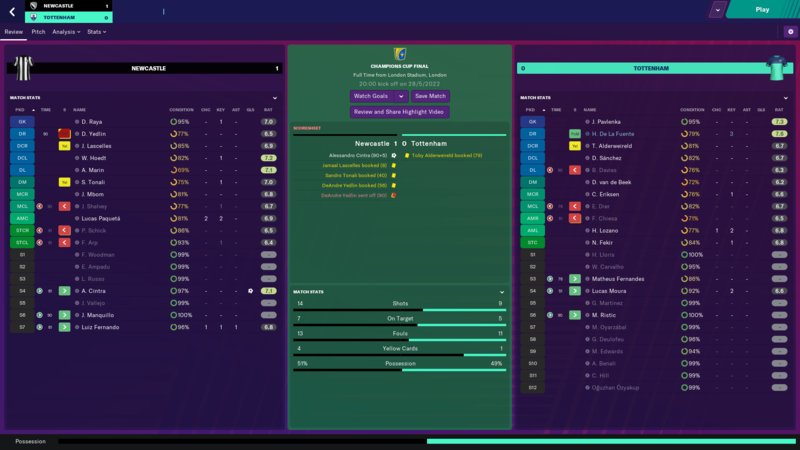 I started a new save with Newcastle using Sortitoutsi's winter update, literally a day before the 19.3 update which was a little annoying however I've had an unreal experience especially with my tactic that I was tinkering around with for a long while. 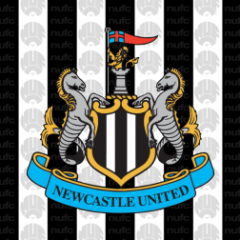 I think it suit's Newcastle's play style massively with the likes of Shelvey, Ki, Ayoze, Almiron to name a few. I looked to keep possession for long periods of the game and using a fast paced passing style which would aggravate the opponent to come win the ball therefore opening gaps for the likes of Ritchie, Kenedy and co to exploit. 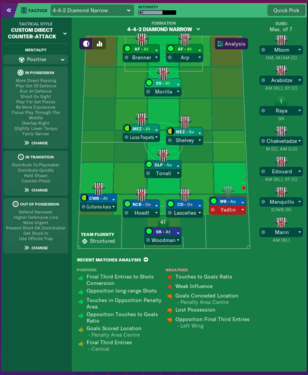 I kept the first transfer window closed due to the fact we had signed a couple of players already which I wanted to incorporate from the beginning, I had then introduced this 4-2-3-1 tactic very early on into pre-season in order to get the likes of Almiron especially used to getting the ball as much as possible and shooting basically whenever the opportunity arose. As you can see the high pressure defending worked very well and the likes of Lascelles/ Schar / Clark worked very well at picking up the loose balls that often dropped around the area due to our midfielder's closing the space so quickly. 37 goals conceded throughout a season is a massive positive and gives us a fantastic starting point for next year. We also topped the passes completed stat over the course of the season which in turn... if we have the ball they cannot score! A fantastic season overall for us ending the campaign in the Europa League, we were looking at Champions League for large parts of the season and we were very unlucky not to pinch it at the end. A few little niggles and long term injuries knocked the stuffing out of us in the run in at the end of the season. 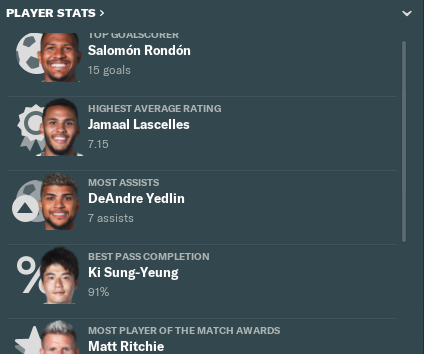 The main focal point to our attack was definitely Rondon and his hold up play, movement and obviously his finishing helped us pull out some fantastic results against some of the big teams throughout the season, obviously next season he wont be with us so we will be looking for someone with the same attributes that he has! 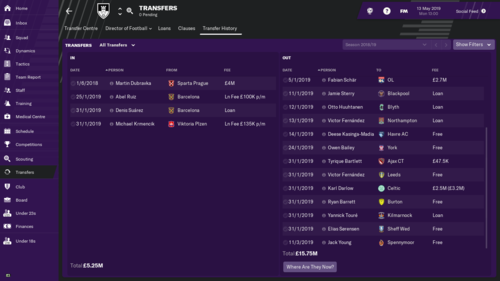 Obviously our transfers in real life Almiron and Barreca have came in as well as some fantastic young players that will be used from next season onwards, we will also look to make Barreca's transfer permanent due to his technical ability and how much better he is than Dummett. Getting rid of Gayle will also open up a large space for us to fill next year. 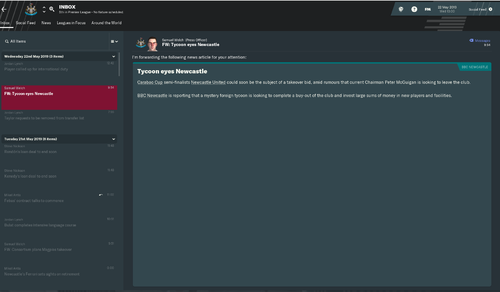 Started a new game with Newcastle on the new patch and just finished the first season. We got taken over by a consortium in the first season but now we are going through another takeover this time a tycoon has anyone ever had two takeovers go through two seasons in a row ?